The city’s oldest public housing complex is set to undergo a $36.5 million transformation after winning a competitive tax credit grant, a release from public and nonprofit housing officials said Tuesday afternoon. The project will provide 212 affordable apartments for residents of different incomes. Those will include 96 deeply subsidized units for some of Asheville’s poorest residents presently living at the complex south of downtown. The complex was built in 1950 and is surrounded by a construction boom, including the expansion of Mission Hospital, new businesses going in on downtown’s South Slope and homes being built on Southside Avenue. 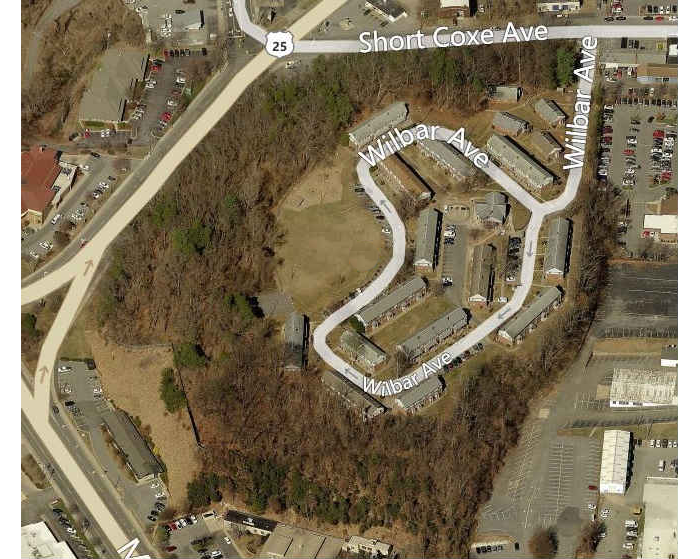 “Lee Walker Heights is currently isolated from these improvements due to steep slopes and only one street connection,” said the release by the Asheville Housing Authority and the nonprofit Mountain Housing Opportunities. A second access point will be built through a former car dealership property now owned by Duke Energy. The new road would connect residents to Biltmore Avenue. The current single access point is a steep road down to Short Coxe Avenue. The change should help residents reach resources such as public transit, which in turn can help with access to jobs, officials said. Officials estimate 100-150 children will have new homes that incorporate sustainable green components, high-efficiency heating systems and Energy Star appliances. Project planners worked with residents to help decide about apartment layout and features. “I hope to continue this journey with the housing authority to help create better affordable housing conditions in the future,” Reid said in the release. The project should start in 2019 and should be completed by 2021. The competitive process entered by the housing authority and MHO was for $12 million in tax credits. The money was awarded by the North Carolina Housing Finance Agency which had control over the federal tax credits. Also adding to the project are Asheville and Buncombe County taxpayers with each local government providing $4.2 million for a total of $8.4 million. The $36.5 million pricetag is $4.5 million higher than a $32 million estimate made in 2017. Officials didn’t immediately address the difference. The lower estimate came from a prior attempt to get funding for the project. That plan made in 2016 sought $16-$18 million in tax credits. It also called for 92 fewer apartments with 120. But the applicants failed to win the credits. Some residents and activists have raised concerns about whether residents would really be able to return. They pointed to a private complex whose residents received Section-8 federal subsidies and who were displaced when that complex closed. That was McCormick Heights complex near McCormick Stadium, which was torn down in 2006.